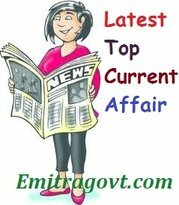 Current Affairs Question 2017: Looking for 3st August Current Affairs? Then start your Quiz right now by answering them. Here in this article, we are giving the Current Affairs Quiz with Questions and Answers. As many people are preparing for various government exams it became mandatory for them to get a grip over the current affairs as in most of the tests are based on Daily Current Affairs. By taking this kind of Current Affairs Quiz candidates can eventually get hold of what they have been working on. Contenders can trust us as we will update all the latest Current Affairs in this quiz. For more such quizzes check our site Emitragovt.com regularly as we will update the Daily Quiz for current affairs. 1. Sanjaya Baru was on appointed as the Secretary General of the Freedom of Indian Chambers of Commerce and Industry (FICCI) with effect from 1 September 2017. 2. Airtel Payments Bank, India’s first payments bank has announced a strategic partnership with Hindustan Petroleum Corporation Limited (HPCL). There are around 14,000 HPCL fuel stations will act as banking points for Airtel Payments Bank. 3. Jharkhand Cabinet has approved Religious Freedom Bill 2017. The bill named as Jharkhand Freedom of Religion Bill, 2017 seeks to bring the stringent anti-conversion law in place under which forceful or allurement induced religious conversion will be a non-bailable criminal offence. According to an official release, Section three of the Bill prohibits forceful conversion. 4. The US Senate has confirmed the appointment of Christopher Wray as the Director of Federal Bureau of Investigation (FBI). Wray was elected to the post by winning 92-5 votes of the Senate. 5. India’s richest man and Reliance Industries Chairman, Mukesh Ambani overtook Hong Kong’s Li Ka-shing to emerge as Asia’s second-richest man. 6. Senior bureaucrat Ambuj Sharma has been appointed Secretary-General, National Human Rights Commission (NHRC). 7. The UN Office of Drugs and Crime (UNODC) and the Home Ministry have joined hands to combat human trafficking originating from the neighbouring countries. 8. American neuroscientist Marian Diamond who studied Albert Einstein’s brain in 1984, passed away. She was 90. 9. JNU Professor Manoj Pant has been appointed as the Director of Indian Institute of Foreign Trade (IIFT). 10. State-run India Tourism Development Corporation (ITDC) has appointed Ravneet Kaur as the Chairperson and Managing Director. 11. The government has allowed trade of several commodities at four border haats between India and Bangladesh. McCloughan who ran into danger to save wounded soldiers during a Vietnam War. 13. Technology giant Cisco has named former Philips Healthcare executive Sameer Garde as the President for its India and SAARC operations. 14. Off-spinner Moeen Ali became the first English spinner in 79 years to pick up a Test hat-trick against South Africa. 15. E-commerce major Flipkart completed the merger with eBay India’s operations.